Higher Education Technology Summit #HETS2016 a Success! To our attendees: Thank you for helping to make our first Higher Education Technology Summit a success. We realize this time of year is exceptionally busy and appreciate your taking the time to attend! We hope that you were able to take away some valuable information from the sponsor sessions and the technology manager panel discussion. We’d like to offer our sincere appreciation to the panelists, Elaine Mello, Tim O’Neil and Mike Lucas, and the moderator, Margot Douaihy, for the excellent information during the technology manager panel discussion. To future attendees: We are in the process of planning additional HETS in different regions throughout the US. If you are interested in hosting or attending a HETS event, please let me know! If you want to know more, here’s some great coverage of our event from our friends at HigherEd Tech Decisions. If you’d like to request a copy of the program of events, please contact me in the comments below! We’ve heard it before- and it won’t be going away any time soon- one of the biggest challenges in AV right now is finding enough trained help to fill the need. One of the reasons for this is that most high school or college age students don’t think about AV when they consider continuing their education and/ or training in the technology industry. AV has expanded beyond push carts and overhead projectors- to the point where most of today’s student won’t even know what that means. Modern classroom AV is installed technology. It is seamless in the room and is becoming an integral part of daily learning and lessons. So students don’t even have to think about it. If it works properly, AV can amaze. But the reason it amazes is not because of the “audiovisual technology.” It’s because it simplifies, stuns, complicates, clarifies, assists, coordinates….it just does. AV has become an integral ingredient in a recipe for learning, experiences, and communication. If left out (like yeast) one will have a “flat” or unremarkable experience. Often, if asked to pick out what made an experience amazing or flat (or anywhere in between), the respondent will answer “technology.” But as I wrote in last month’s post, this all encompassing word doesn’t necessary include the specifics of AV in its definition. 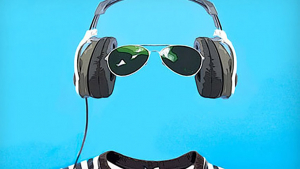 Read more: Has AV Become Invisible? The first Tuesday of every month, the Huntington Chamber Of Commerce Education Committee meets to discuss relevant topics and challenges faced by today’s modern workforce. Then we decide which topics are most important to our local professionals and create hour long seminars. It is a great resource for the business community because these seminars are free, we provide breakfast, and the content is presented by experts in their particular field. The committee is made up professionals from a number of industries including financial planning/ wealth management, graphic design, business consulting, insurance, higher education administrators, architects, you get the picture. We are a diverse group. Today’s meeting was interesting because we had a guest speaker who happened to be the Assistant Superintendent of Instruction and Curriculum for my school district, a K-12 public system with about 6,000 students. He was talking about the nearly $2.9 million in technology grants the school district has received in the past four years. This has allowed them to continue to expand their wireless bandwidth and initiate and grow their STE(A)M programs. Kindergartners are learning drag and drop code, 3rd graders are using a 3D printer and 3D immersion for their robotics and other classes, 4th graders are learning to write code, 6th graders are beginning career readiness training, 6th and 7th graders are rolling out an ongoing 1:1 program with Chromebooks. I can go on. Four well known audiovisual and classroom technologies manufacturers, FSR, Inc, Biamp Systems, Utelogy Corp., and SpinetiX, have partnered to create the first Higher Education Technology Summit (HETS). Created specifically for college and university managers of educational technology, HETS is designed to combine a day of product training, networking and peer-to-peer discussions in a fast moving format. The first HETS of 2016 will take place in Burlington, MA; a location conveniently situated (located off I-95 and 93) for many schools throughout New England. In the world of educational technologies, the discussions about classroom standards and standards implementation are like an unprepared contractor—always yapping about finishing the project but tough to get nailed down. Many of these discussions are open-ended and constantly evolving, coming to under-defined conclusions. Most technology managers agree that standards for campus-wide classroom technologies are essential to efficient, economical and useful spaces. As I have previously discussed, technology standards reduce the training time for faculty, manage expectations of faculty and students, keep student experience consistent, ease budgetary strain and, perhaps most important to technology managers, reduce the cost of and time required for equipment maintenance and downtime. There is no doubt that classroom technologies are a large investment. The need to define and calculate the successful use of the space is essential. To help develop campus-wide standards for most effective and efficient technology rich learning environments, there are a number of guidelines, ratings, and association standards that can be considered. – Read more here. 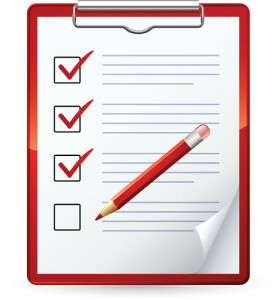 A number of recent articles have highlighted colleges and universities that have successfully developed processes to take classroom technology standardization, design, installation and support “in house.” There are some exceptions (summer projects for which they may need outsourced labor to complete the rooms before classes begin, or new buildings for which they may not have hired additional staff, etc.) but it is more common now for higher education technology departments to rely on their own teams to not only oversee upgrades and installations but to develop the skills to be the consultants/ designers, installers and technicians for the entire job. While this may prove to be economical and efficient, it puts some new stress on these technology departments. An obvious challenge is hiring enough staff for these new responsibilities- and maybe not simply hiring new talent, but making the case to get approval to increase the budget to hire new staff. One challenge that may not be as obvious is finding time and resources to keep up with new technology, product training and professional development. Many technology managers no longer rely on dealers for their training but it can seem that on-campus training from manufacturers is not always offered. Additionally, the budget for off-site training, conferences and classes is usually skimpy at best. And many times technology managers have to use personal time for professional development days. Even keeping up with certifications, whether manufacturer specific or industry specific can seem like a battle. All of these speed-bumps add up to one big hill. How do you keep your team properly trained so that you can continue to bring all AV systems services in house? 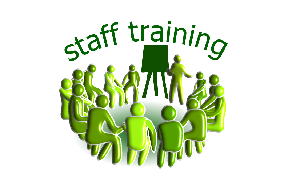 Read more: AV/ IT Managers: How do you keep your team properly trained? I don’t love country music, in general. But there is a song that makes me smile; I turn up the volume and sing and dance around like no one is listening or watching, no matter if there is. I am going to take you on my special Gina journey of conversation whiplash- please try to follow- and I will explain how this song is relevant. It came to me in the middle of the night (different song- but would love to see Billy Joel in concert again someday soon) when I couldn’t sleep and was trying to calm my brain…. For its relatively small size, the audiovisual industry has more proponents, fans, enthusiasts and cheerleaders within it than many other larger industries. In fact, I argue that there are more AV evangelists than in the closely related but much larger IT cousin industry. I don’t exactly have the numbers, but I’d say that the drive to “create exceptional experiences” (thanks InfoComm AVEC) cultivates an exceptional amount of passion. This passion isn’t exclusive to a single part of the industry (although I am partial to AV in education), job function, age or gender. It seems to be something that starts as a seedling and continues to grow, like the Grinch’s heart, until it is bursting at the seams and has to be shared. It is contagious. FSR+Connectrac In-Carpet Wireway is almost seamless. 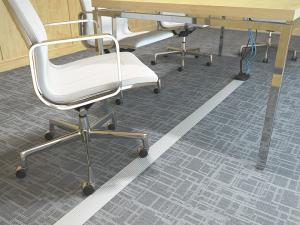 The new FSR+Connectrac On-Floor and In-Carpet Wireway systems are the best alternatives for open space connectivity when aesthetics, flexibility and value are important. Both the on-floor and in-carpet options install quickly and are extremely durable and low profile. These wireways offer a wide array of power/AV/telecom connectivity options, are pre-wired for speedy installation and are ADA compliant. On wall wireway and wall/ floor transitions are also available! Click here for more information. Or for a demo, pricing or accessories, please contact us! The NY Metro area Society of Marketing Professional Services (SMPS) recently coordinated a panel discussion called “Higher Education Builds To The Future.” They invited three campus and facility planners/ managers from prominent private NYC universities, including New York University, Fordham University and The New School, to discuss new building construction, building renovations and technology installations that they are working on to attract new and retain existing students. While the morning conversation was very helpful for the architects, engineers, designers and consultants who were present, I think that some of the information I came back with is also interesting to technology managers and facilities managers across the country. It is worthwhile to note the challenges that other colleges and universities are experiencing and how they navigate those challenges. Being able to share information and possibly generalize those ideas to help you develop a solution to similar problems is valuable. It is also one of the reasons why peer-to-peer events such as (my very favorite) CCUMC conference and its frequently utilized list-serve are so popular and continue to offer consistently worthwhile content and communication. It isn’t about manufacturers or service providers telling you what challenges [they think] you have and how they can help solve them- it is about those IN YOUR POSITION explaining and showing how they are finding solutions to these challenges that they are faced with daily. Contemporary classrooms should be active spaces. Meaning that instructors focus class time on collaborative and practical application exercises as well as individual work or lecture centered periods. 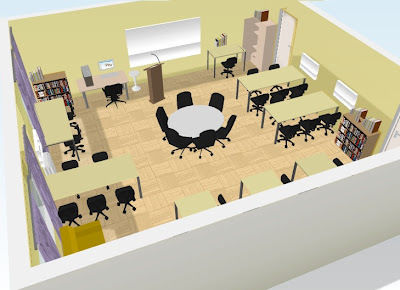 An active learning room can be designed as if there is no front or back of the room; round work tables or movable desks and tables oriented in circles or semi-circles are placed throughout the room. White boards and displays (or projectors and screens) can be situated on the outside walls next to the group work tables. Each area should have connectivity and power for laptops or tablets This layout allows smaller groups of students to work together on course curriculum and help each other through problem solving and comprehension. The technology and ease of connectivity offer immediate research opportunities, sharing information between students and instructor. Being able to bring chairs or tables together creates an environment that is more open to discussion and interaction. This flexibility changes the dynamic of the students and teacher. It creates a welcoming environment to share ideas and opinions. It offers the ability to have areas of the room designated for hands on learning potentially giving permission for students to feel able to move about the room freely. Rooms with fewer obstacles and more open designs seem to be more inviting. Acoustics, daylight, air quality and heat must be factored into room design and equipment choice as they can either increase or decrease distraction. Now that the summer projects are (hopefully) coming to a close and regular term classes are back in session, you can review what you and your team were able to accomplish in just two short months. Whether it was standard room maintenance, general room upgrades, building renovations or new construction projects, there’s a lot to be done for a technology manager between May commencement and fall semester. Considering the scope of what had to be accomplished and the incredibly short timeframe in which to get it all done, many AV and IT teams choose to outsource some of the installation work. 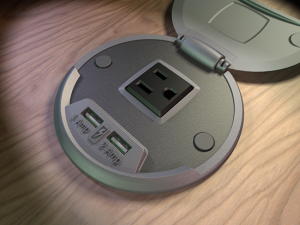 Charging stations are popping up all over campuses. It’s no wonder why when you consider that the average US college student brings 2-3 mobile devices to campus. This number is likely to continue to rise in the coming years. While laptop computers are the most common of these devices, smartphones are a close second and tablets a quick growing third. Just as students expect colleges to offer wireless internet connection across campus (why not, my local coffee house has free Wi-Fi) they also expect convenient and usable locations to charge their devices. 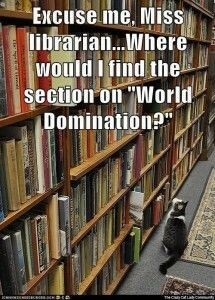 The last time you visited your library, what were you there to do? It may have been to hear a professional development speaker, participate in a book club, bring your child to a “mommy/ daddy and me” group. I was recently reading an article focused on the evolving role of today’s libraries and started considering all the new library conformations I have seen touring campuses across the US for the past 18 months. The required book “warehousing” space (i.e. racks) for libraries has been reduced as a result of digital/ e-books (and e-lending) and the availability of resources on demand at home, school, Starbucks via the internet. Although I have seen many different definitions and uses for modern library spaces, I can summarize all of my experiences into one statement. 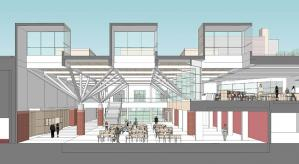 Libraries are no longer for individualized quiet study, they are becoming community hubs. Nowhere do I see more evidence of this than in the rapid proliferation of makerspace areas. Makerspaces are defined areas populated with technology, textiles, hand tools and resources to encourage hands on activities like designing, building, collaborating and communicating. Think of it as a hybrid tech lab and mechanic’s work bench. Very often, in addition to computers, new technology such as 3-D printers are being utilized in these expanded labs. They can also include audiovisual equipment, programming and control devices depending upon the proposed use, design and budget for the space (think scanners, Raspberry Pi, drones etc.) They can be designed specifically for subject matter like robotics, material engineering, prototyping or building or can be configured for more general purpose DIY “making” covering a variety of subjects and specialties. These labs are used to support increased comprehension and retention of theory through practical and real-life applications and community interaction. While makerspaces (also called hackerspaces or hackspaces) can be created almost anywhere on campus like converted classrooms or a corner of a classroom, a dedicated area in a public building (i.e. student union), or as a mobile makerspace on a cart that can move from room to room, it seems like libraries have been the “go-to” for these spaces more than any other. It’s hard to find good help these days. Employees just aren’t loyal anymore. Why can’t they just do what I tell them to do. We often hear these complaints within our organizations. But this isn’t exclusive to corporate America. Educational facilities have the same employee challenges that other businesses experience. In fact, in our ed tech world, some of these challenges may run deeper because of the training necessary to get a staff member “schooled” as a technician, designer, or installer of equipment and projects for which there is little or no formal schooling. How can you encourage employee engagement without compromising the rest of your team? How can you get more long-term productivity and loyalty out of your staff? 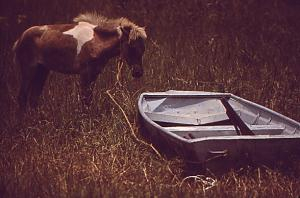 Discover what motivates (your) people: Discovery can be hard work and time consuming. But since your departmental productivity and project timeliness rely on your team, discovery is a worthwhile journey. Motivation isn’t always money. It could be growth potential, professional development opportunities, vacation time, a defined career path, recognition. Whatever “it” is, understand that it can be highly individualized. Don’t just observe your employees but ASK them what is important to them. Listen, outline, and then act on it. 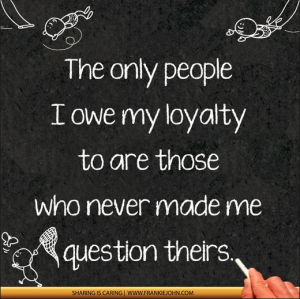 Motivating people is an ongoing process that should be revisited regularly.